These 4 shows have all been individually reviewed on ATVR. The boxset has the shows housed in this cardboard case. Each disc is in the normal DVD case. Outer box looks nice, a little thin. Artwork is nicely finished. The shows are in the standard DVD plastic cases. They match the single releases. The box is the extra feature. The 4 programs are all excellent. There are many rarities to see. Tight scripts and sharp editing are very professional. Vintage footage has been processed for best possible quality. Narrator has a very dry style, and is the weak spot of these shows. The reviewed set was the 2007 remasters. Have not seen any previous versions. The remasters are excellent. An uncommon high quality feature, these are factory pressed DVDs. Most production companies use the cheaper DVD-R discs. The factory discs are more durable to own. A brief overview of the shows. 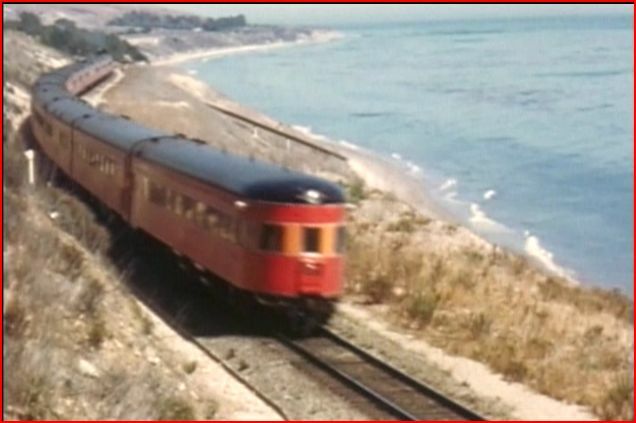 See the full reviews on American Train Video Reviews. For maximum enjoyment- these screenshots are different, than the full reviews! Timeframe from 1940’s to 1957. 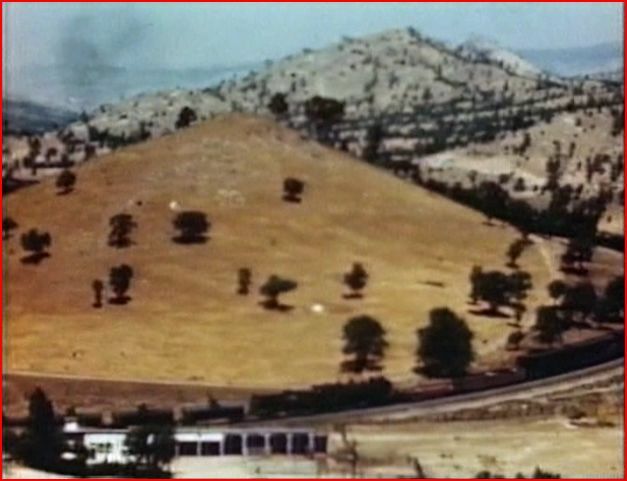 Scenic Siskiyou Line and desert type Modoc Line. Plenty of SP passenger trains. 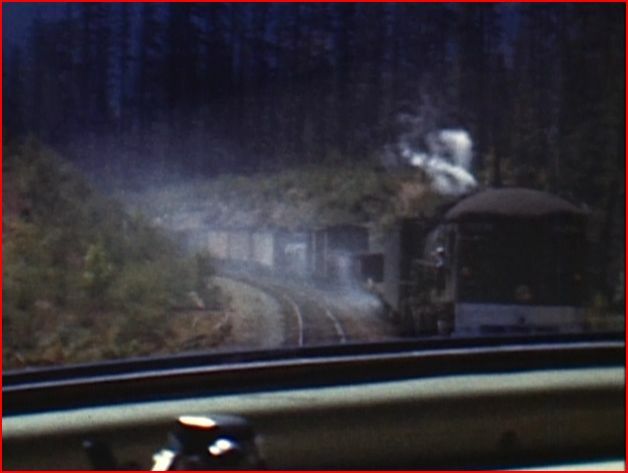 Action on the Siskiyou Line. 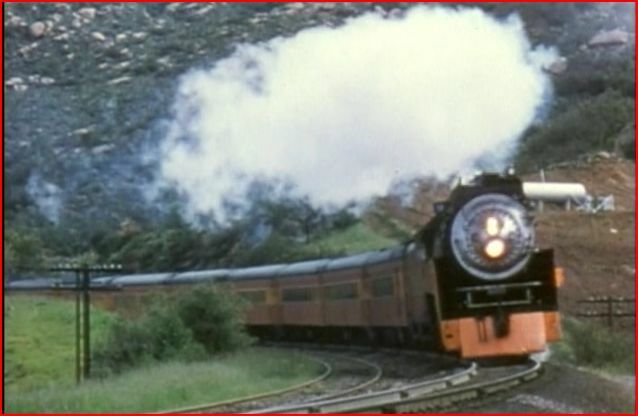 Classic- Southern Pacific Daylight train. The brand new E7 diesels are on a preview run! Mostly in Oregon. Cascade, Siskiyou and Modoc lines. Cab rides are included. 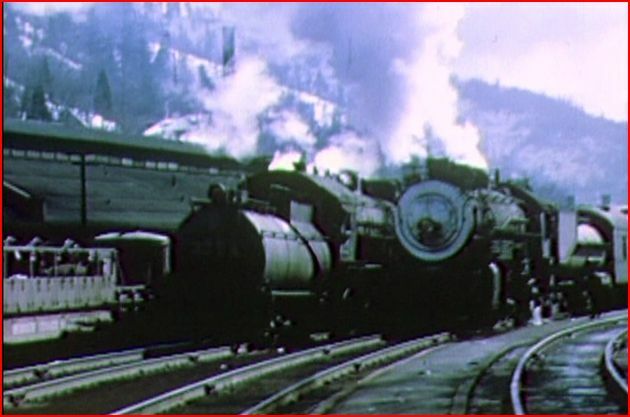 Many steam and early diesel locomotives, operating in Oregon. 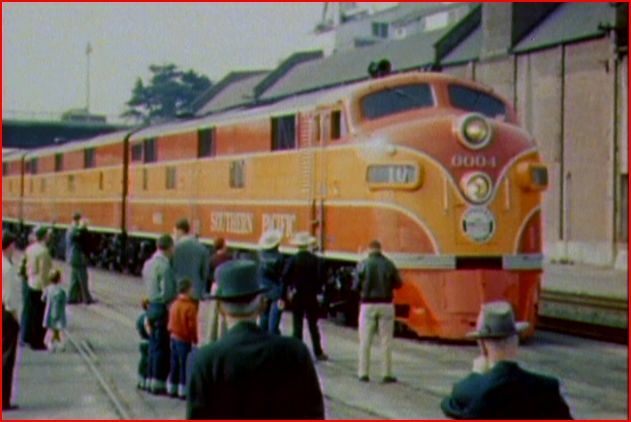 Alco PA’s were the modern diesel of choice on passenger trains. Shasta Springs at dusk. 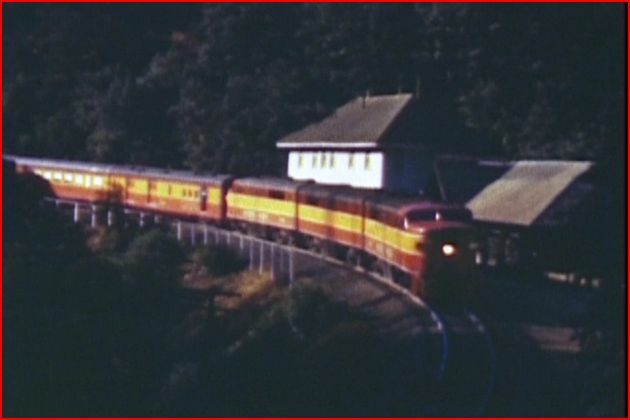 A 1949 cab ride aboard a daylight livery Alco PA is a highlight of this show. Cab Forwards are easily found. 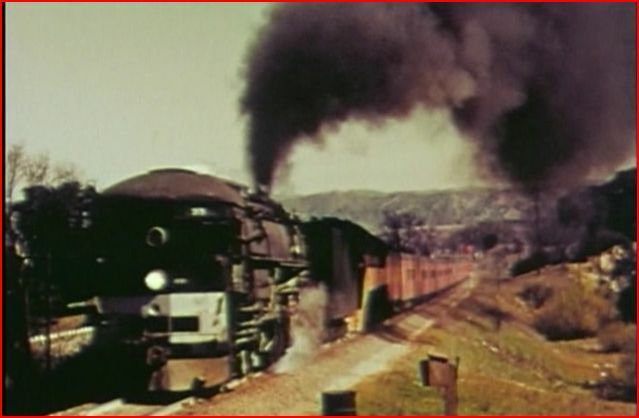 That’s brake smoke from the oncoming freight train. There is a wealth of cab ride action. Logging also is another highlight. Oakland to Los Angeles. 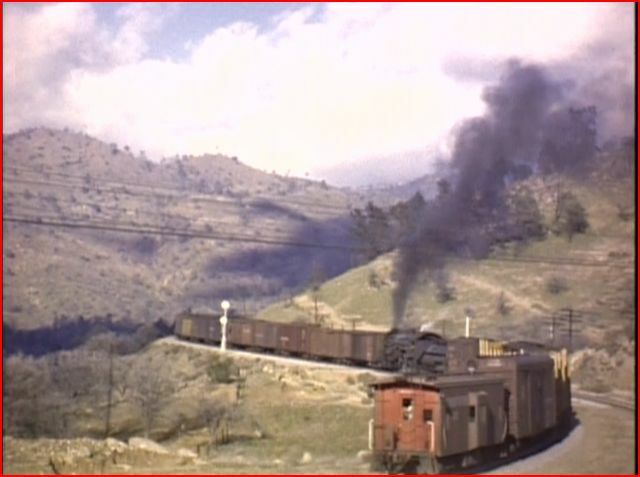 Tehachapi Loop. Circa 1950. 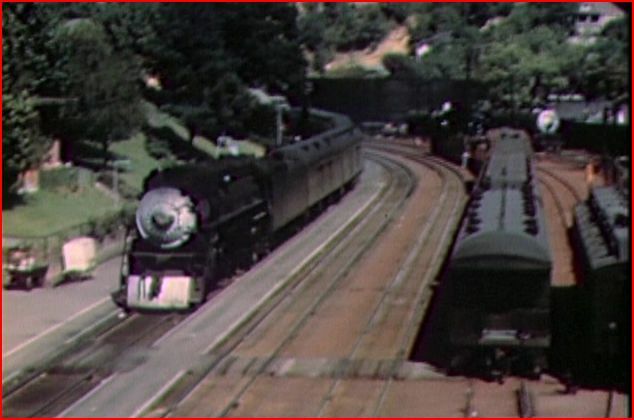 Many passenger trains in this show. Ever see the movie Duel? That background gasoline tanker truck looks like the one! 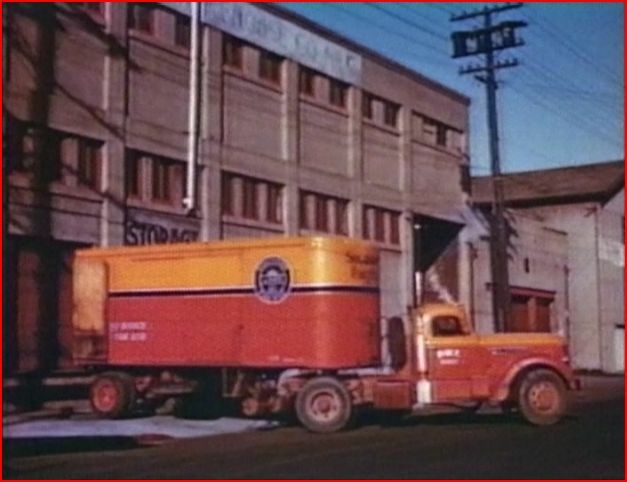 LCL was: Less than Car Load. Many facets are seen, of other operations on SP. 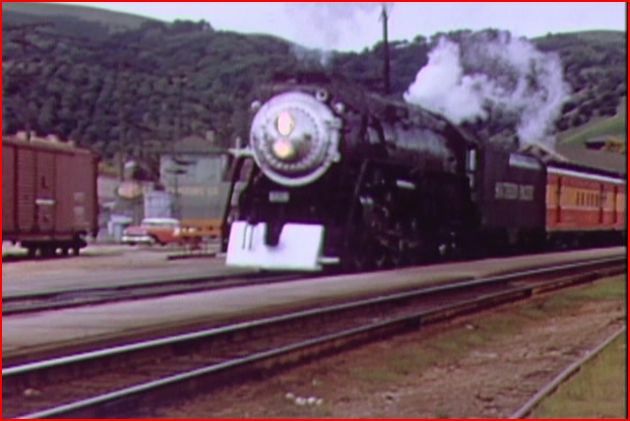 Tehachapi Loop hosts much action in this show! 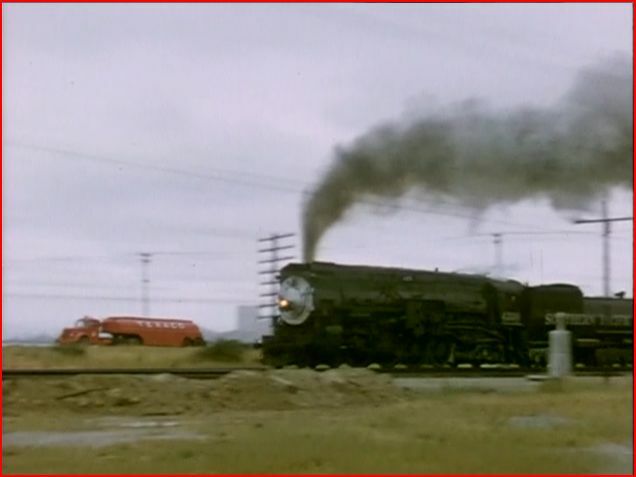 Freight trains are seen with mostly steam power. 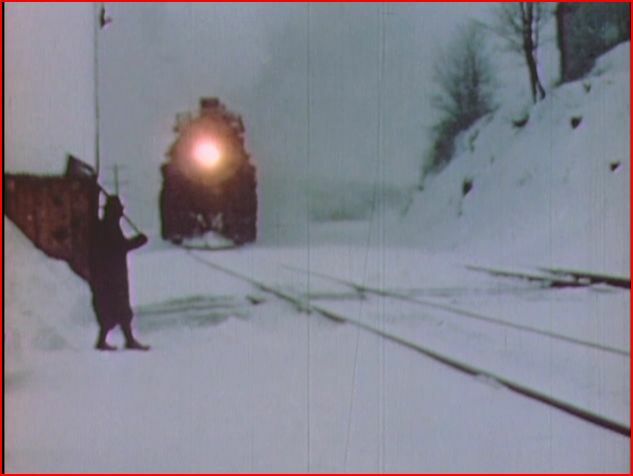 Those mid-train helpers are a must. Los Angeles to San Francisco. SP Daylight trains are found here. Very Colorful show! SP Coast Daylights are the stars. 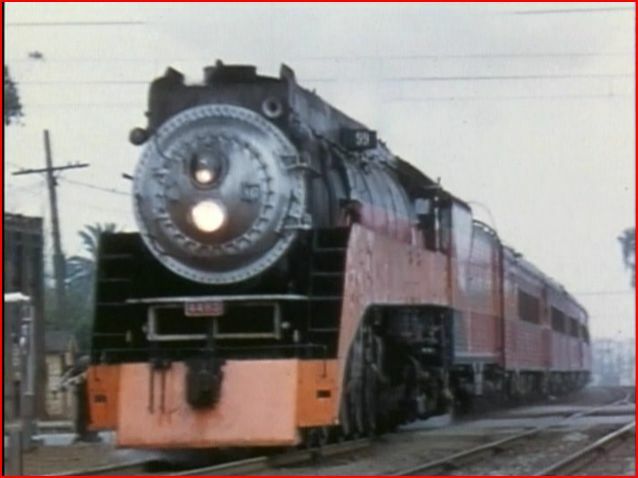 This is the place for these classic steam locomotives. 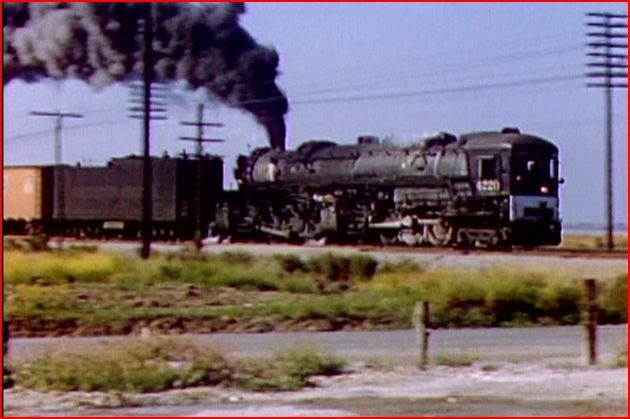 Ride on a Coast Daylight, behind steam! Visit the Alhambra roundhouse. Hint: it is packed full of Daylight steam! Cab Forwards and doubleheaded steam. There are additional combinations in the show. 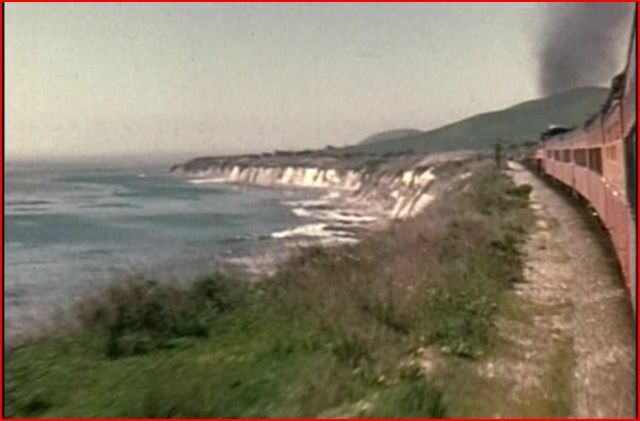 The Southern Pacific Coast Route, contains some ocean views, as seen here. 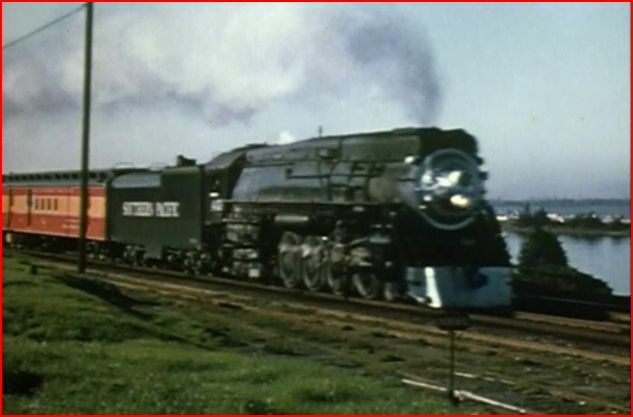 Catenary Video has a high quality series with, Southern Pacific Steam. The 4 volumes are very enjoyable. 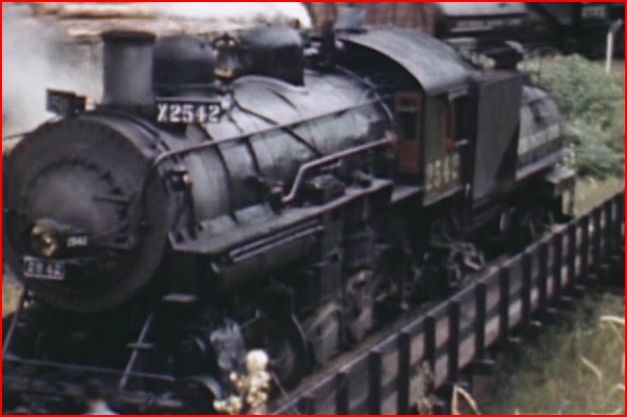 Any railfan with an interest in steam, will find this a valuable collection. This set should be considered a deluxe level release. Heavily researched, very detailed, and well written programs. The only weakness, is the narrator: dry and rather boring to hear. Everything else in the shows is excellent, we’ll forgive the choice of the voice. 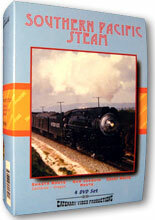 Southern Pacific Steam boxset is an outstanding collection to own! 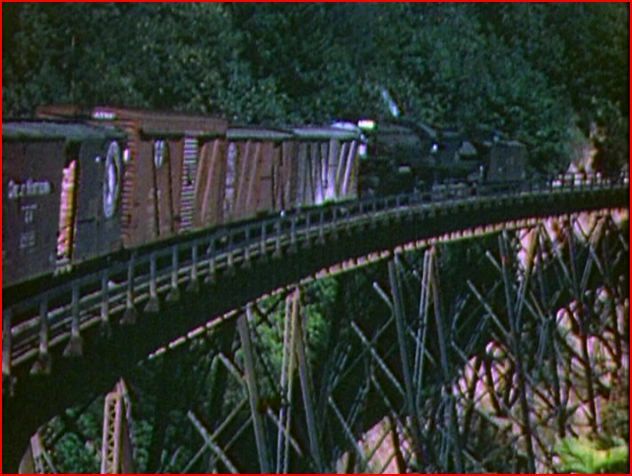 This entry was posted in ATVR Reviews, Catenary Video, Steam Train Reviews and tagged American Train Video Reviews, California, Railroad, Southern Pacific, Steam, Steam engine, steam train, Train DVD, train video reviews, transportation by William J. Hudson. Bookmark the permalink.